Kirk, I feel your pain. Every once in a while I buy one of those edge finders with the LED that comes on when it touches. They work great and are a real boon for my aging, poor eyes. Unfortunately, tney won't take kindly to being run past center and inevitably, sooner or later, I crank the mill table the wrong way and destroy the edge finder. Guess I'm stuck with the spring loaded ones. I bought a couple of replacement sensors that arrived today. We'll see if they survive longer. An interesting fact is that each new sensor needs to be adjusted to be concentric to the tester. To do this I clamped my B&S indicator to the mill vise and adjust so that the sensor is centered on the indicator, which is accurate to around 2 tenths according to the dial divisions. The sensor can be adjusted to about 4 tenths total runout, at least on my CNC mill. One use that occurred to me is that I can use it to perfectly center my QCTP lathe tools. Hold the Haimer in my 5C collet chuck on the lathe, move the tool tip underneath the sensor, and use the adjustment screw to zero out the reading. 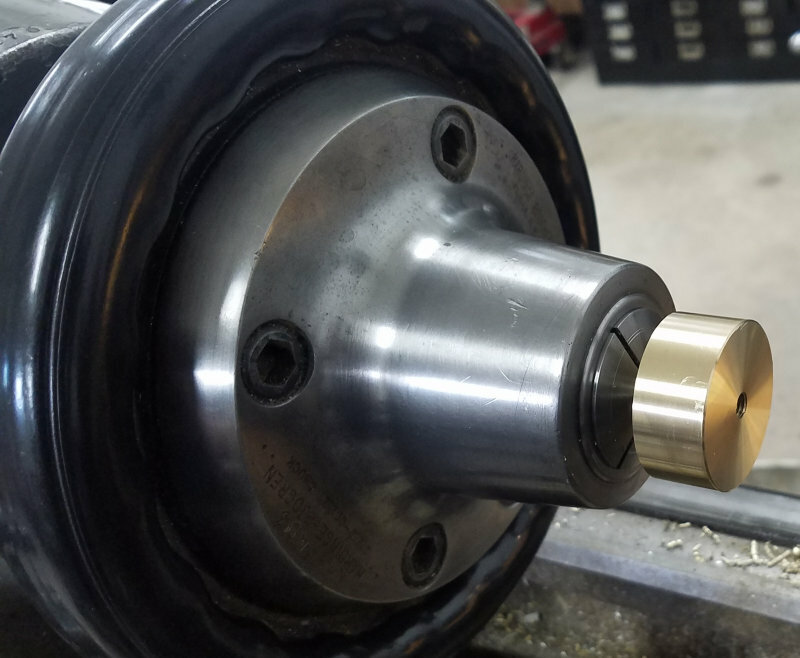 Back on the topic of the failed bearing bracket, I have come up with a different approach that I think will work around the problems of the first attempt. I'll post my result when I get back in the shop to test it out. Completed the first few ops on the new strategy for the brackets: all 1-piece. This used 1-7/8 hex. I left 3mm of connective tissue to hold the two parts together until the end, once freed from the hex. 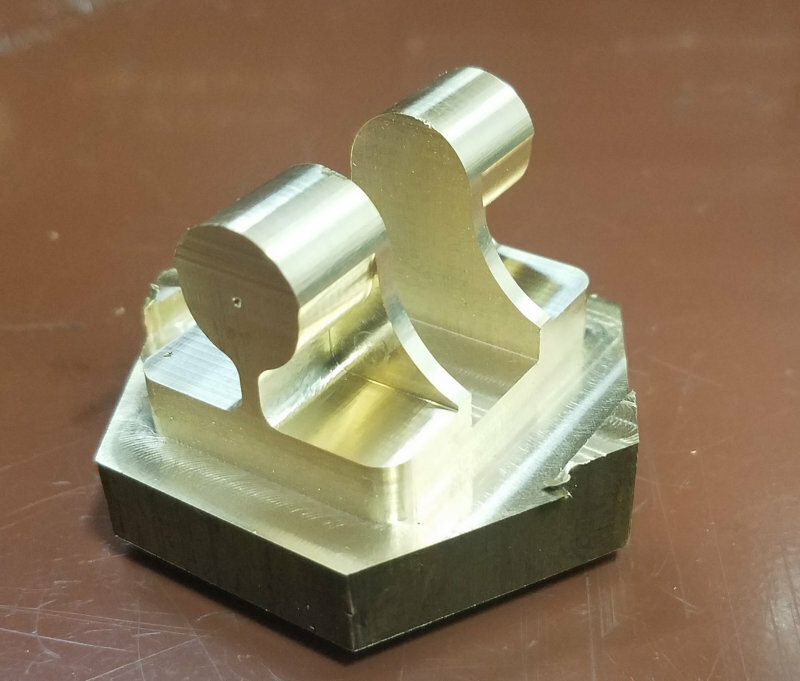 You achieve very nice surface finish Kirk - is this down to very good tools (mill etc.) or is it a light finish cut in the code (or both) ? The outer profiles used a 3/8" 3-flute HSS endmill with 1.5" DOC. Inner pocket was a 5/32" carbide endmill with same DOC. Both cutters are relatively new and sharp and are US-made. I gave up on Chinese/Indian tooling a good while back. Attending the NAMES show each year is a good chance to stock up on new-old-stock endmills from several vendors. Rest of the ops on these parts were done on the Bridgeport. First, drill the mounting holes for 5-40. Then drill and ream the holes for the shaft (.251" reamer for 1/4 shaft). I received the material for my base do-over and thus far haven't messed up. Posed with the cylinder to give a sense of scale. Still many holes to be drilled and tapped. Looking like it will be an impressive engine. 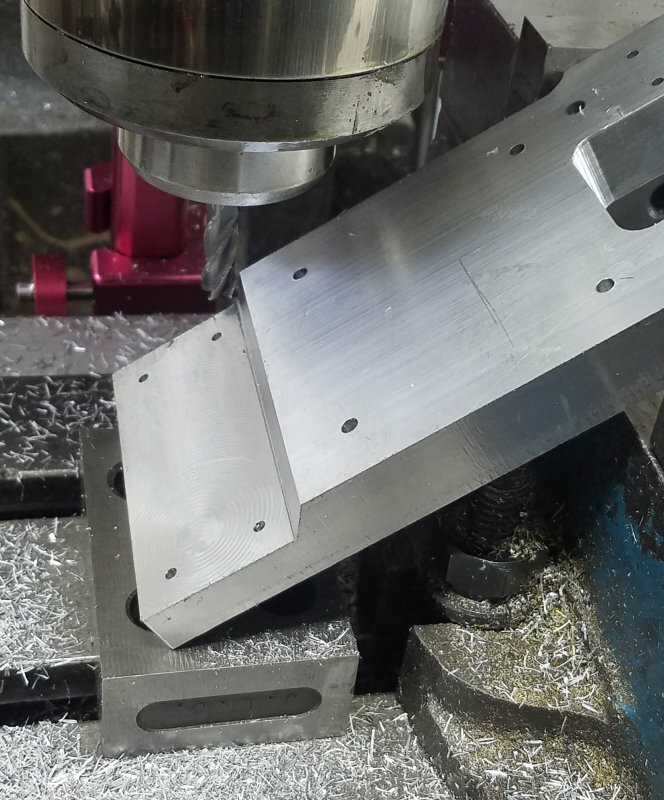 Got all the holes drilled in the base, so the only machining left is the angled face between the two levels. On the drawing it's 35.5 degrees, so since I don't have a 1/2 degree angle block I'll settle for 35. Using the 25 and 10 blocks together, I positioned the work in the vise. Then it was a matter of eyeballing small cuts in both X and Z axes. Then an hour to tap all of the 5-40 and 8-32 holes. 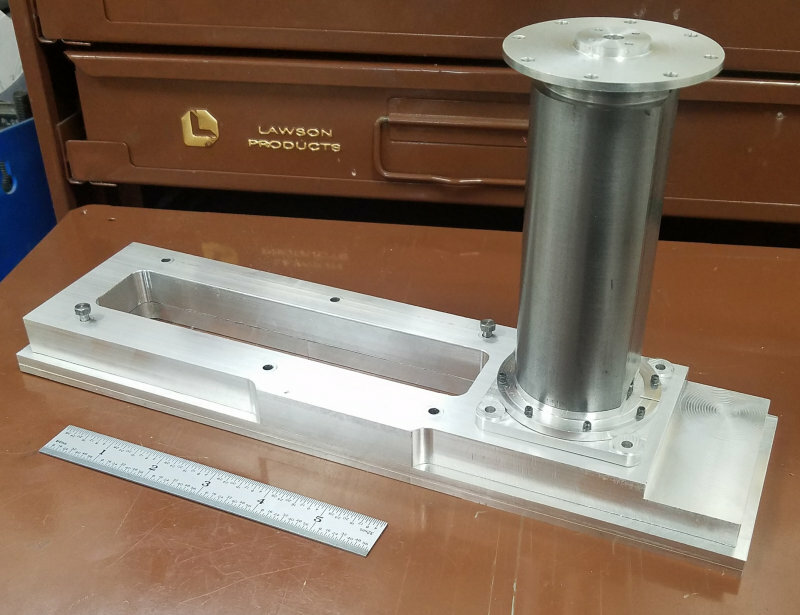 Here's a trial fit of some of the parts. I have missed a few days of posts Kirk. Its starting to come together and looks great. Will try to keep up better. Everything looks first class Kirk, this project is really moving along. I need to figure the best way to make all the rods that support the beam. Since they all come is pairs where the dimensions between the cross holes need to be pretty precisely the same, I'll either need some CNC technique or a clever jig. 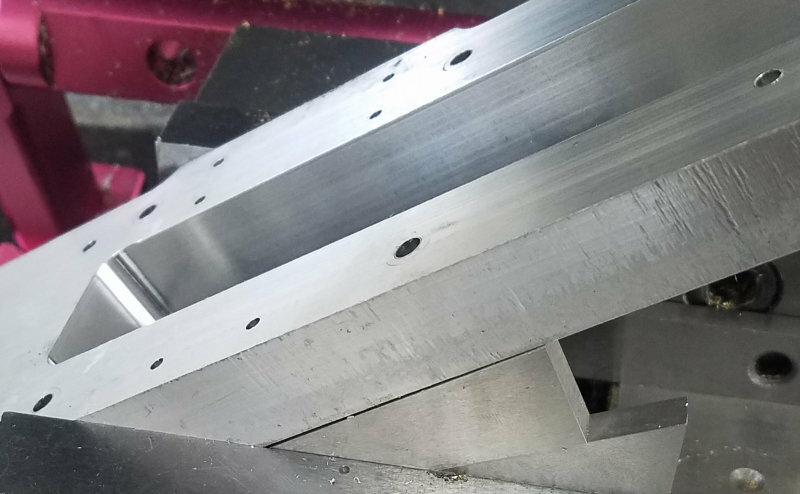 In the meantime I've ordered some aluminum stock to make the lengthwise support beams. I'm heading out on a 1-week trip starting Wednesday morning so there will be a gap in any progress. Today I decided to make the piston and start on the piston rod. Took a 7" piece of 1/4" drill rod and threaded one end 1/4-28 x 1/2". 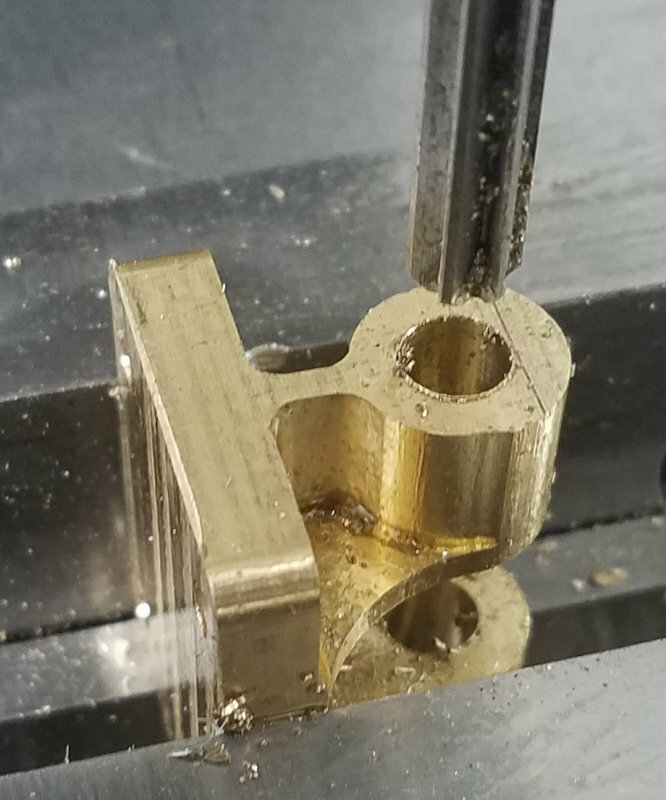 Then for the piston I took a chunk of 1-7/8" hex brass on the lathe; faced, drilled 1" deep (#3 drill) and tapped 1/4-28. 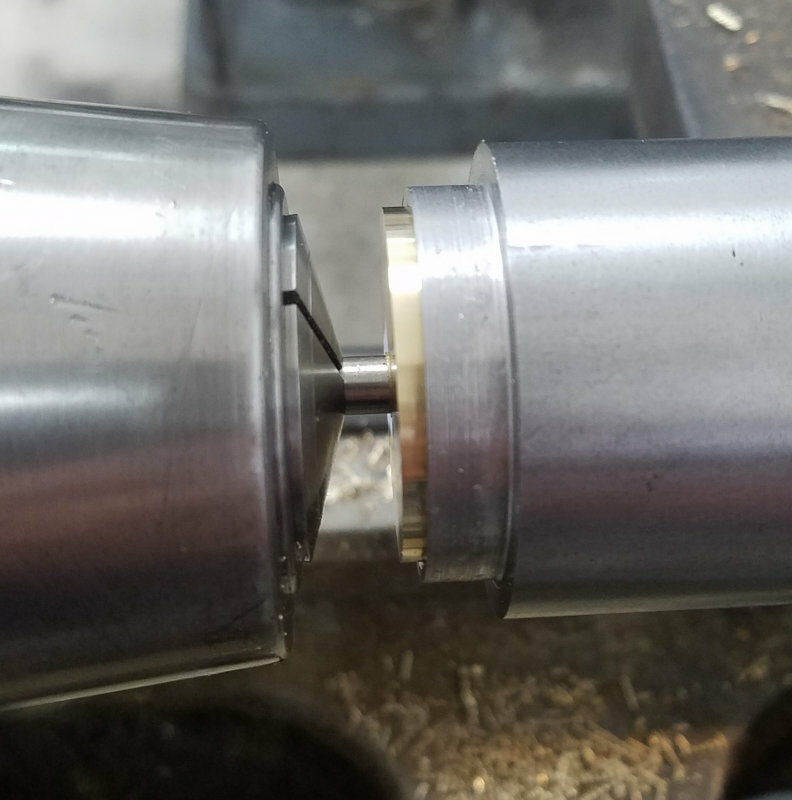 The turned down the end to 1.75" round and parted off a 3/4" length. 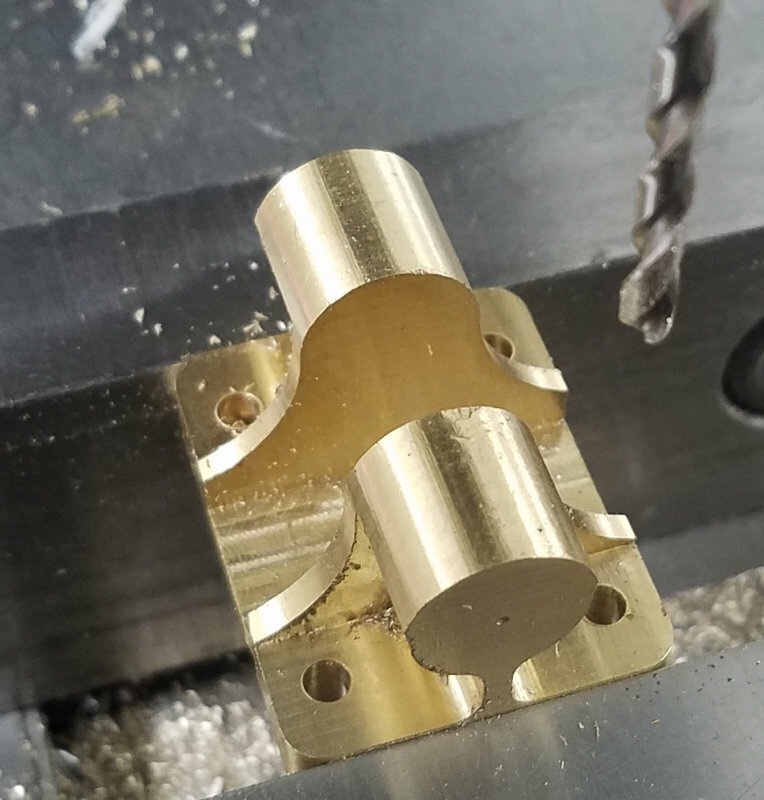 Now I could screw the brass onto the drill rod, and from then on turn with the rod in a 5C collet chuck. 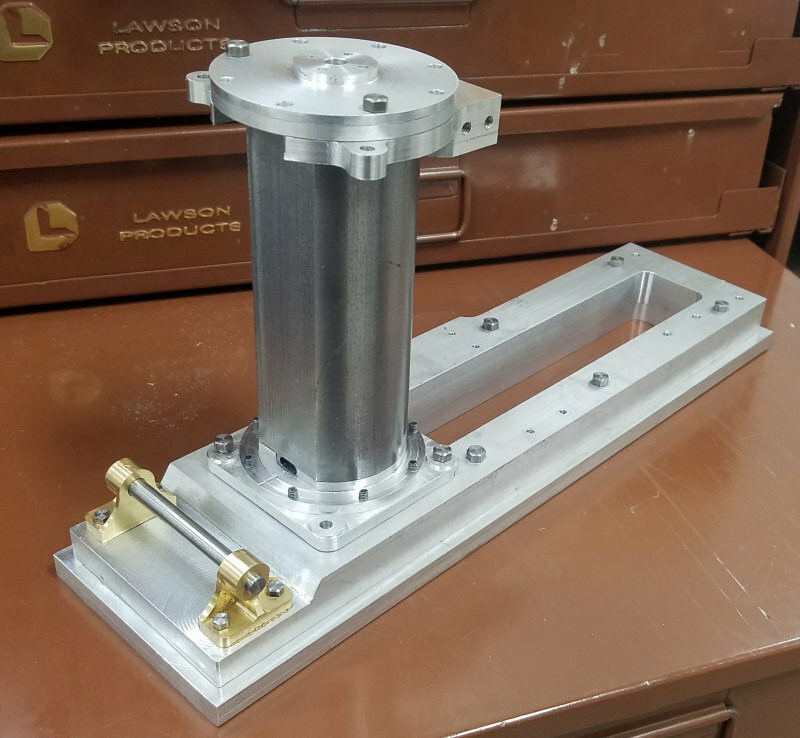 This ensures that the piston and rod will be concentric. Measured the diameter with a mic several times as I turned it down, and finally went to 1.501", where I could just fit it into the cylinder. Given that the tube has a honed bore with no taper, I was not surprised that the piston was able to fit smoothly inside end to end. What was really pleasing was that with the flange and cylinder cover in place, the rod and piston moved smoothly through the cover without any binding. Both the piston and rod are left overlong. I have to adapt the ends of the piston rod and conrod to fit the v2 split beam. Julius drew v2 to have spit bearings with wedges and cotters at the beam ends. I may well content myself with non-split bearings, with the ends threaded onto the rods to allow length adjustment. 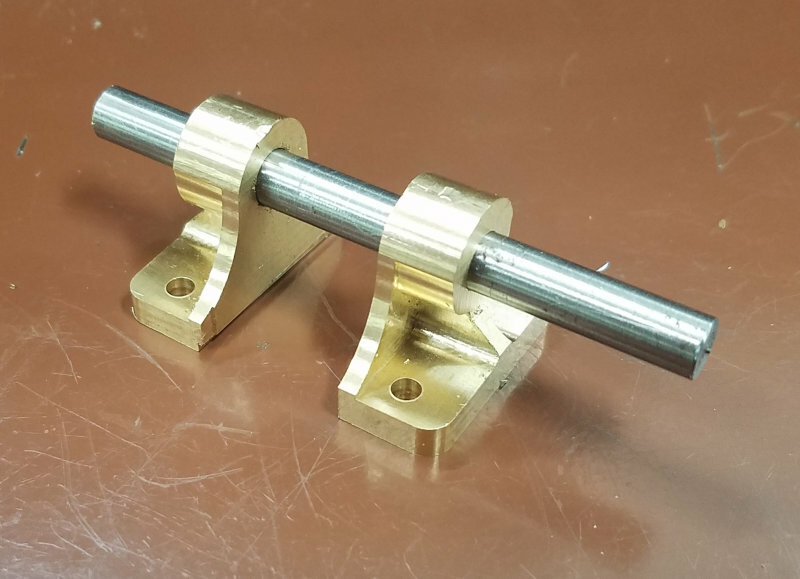 Making all those bars the same length between holes is a perfect spot for a jig - drill the holes in one end of each bar, use that hole to screw it to a rectangular block in the mill vise. Move the table over the distance needed, and lock it down. Then drill each part, using the first hole to hold them to the jig (can put another clamp on to hold the bar into a groove to hold it straight).